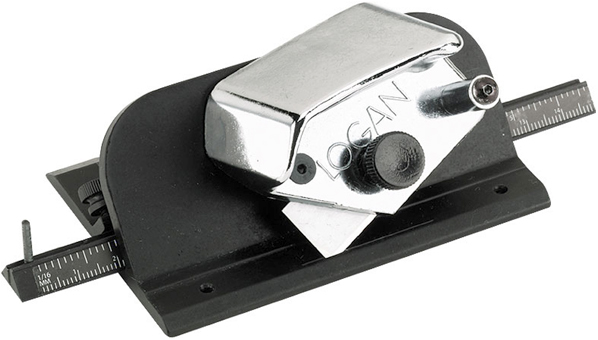 * The Deluxe Pull Style is Logan's most advanced handheld mat cutter, including features developed and refined by Logan since 1974. The Deluxe Pull Style includes a marker bar system for faster marking, a pivot-and-pull blade, and an ergonomic handle. * The blade slot prevents blade flex, resulting in straighter cuts. * A start-and-stop indicator helps to eliminate overcuts. * New ergonomic knob for comfortable operation. * Can upgrade for use on the Adapt-A-Rule straight edge and Compact or Simplex board mounted mat cutting systems. * Uses Logan 270 blade. 8" x 7.875" x 3.25"